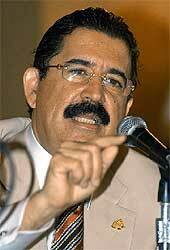 Juan Cristóbal says: – Manuel Zelaya today announced the take-it-or-leave-it agreement proposed by Costa Rican President Oscar Arias was “practically dead.” Surprisingly, this appears to leave Zelaya, not Micheletti, in a bit of a jam. For weeks now, Zelaya has been threatening to go to Honduras and fight for his job. Following an aborted landing that looked fake to begin with, Zelaya vowed that he would return if negotiations failed. Well, guess what? They’ve failed. Deep down, Zelaya looks like a man who doesn’t want to go through all the trouble. I’ve been around too many coddled maracucho ganaderos to be fooled by his groomed moustache and his expensive cowboy hat. Returning to Honduras would mean going to prison. Not surprisingly, he is desperately looking for alternatives, almost regretting the vow he made to return no matter what. Will he do it? The Micheletti government has signalled it is willing to jail him regardless of what the international community thinks. If Zelaya lands and is placed in prison, chances are the Honduran “street” will shrug it off. But if he doesn’t go, he will have lost a ton of credibility. Unless something dramatic happens, it looks like the opera buffa that is Honduras is likely to continue.